We create vibrant, beautiful, diverse solutions for our clients. Got print Design or branding needs? Call on our Creative Services department. Need a new web site or some pro audio/video? Media Services will be there in a flash. Need it all? Together we're magic! 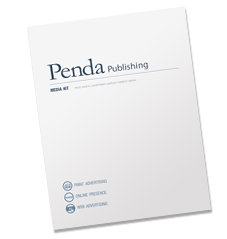 Penda Publishing's in-house design departments are available for all of your design needs. Our team of Creative can create logos, branding, and advertisement champaigns for your business as well as developing web sites and other multimedia campaigns. In today's world having a strong brand and consistent look is key. Let our creative teams show you how easy and affordable it is get there! It couldn't be easier to get started! to set up your appointment. You'll meet with experienced professionals to assess your design needs. Then just leave it up to the our Creative Services department to envision the best design solution for your business.